High-powered maneuvering systems and larger logistical features incorporated into today's new generation of cruise ships are causing seaports to take a close look at the infrastructures with which they are serving the industry. Management considerations related to terminal operations and logistics must first take into account the requirements posed simply by the increased size of some of the latest cruise vessels, such as RCI's Voyager of the Seas, Princess's Grand Princess, and Carnival's Triumph. In terms of implications related to vessel size, the first place impacted by the enormity of the megaships is the dock facility itself, which must be equipped to handle severe line loads necessary to hold their ship safely at berth. This means extra-heavy-duty docking hardware, fendering, bollards, fits, cleats, etc. 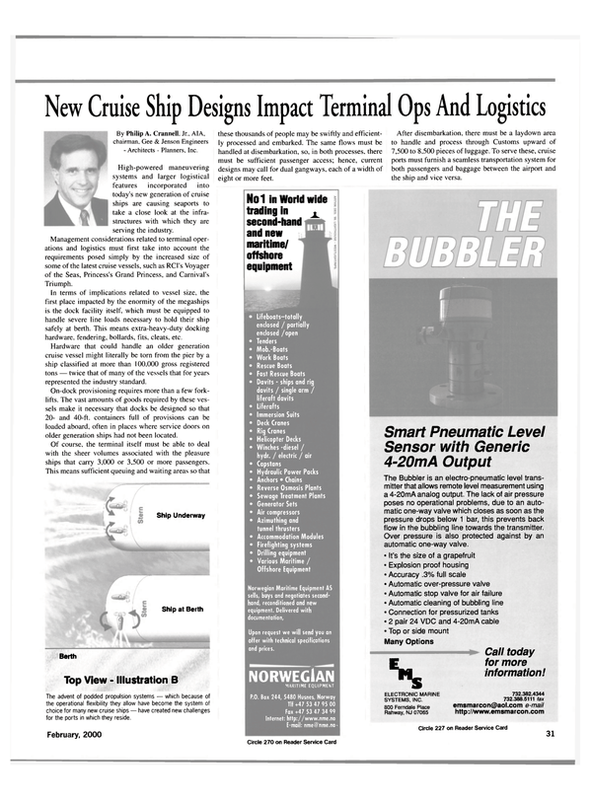 Hardware that could handle an older generation cruise vessel might literally be torn from the pier by a ship classified at more than 100,000 gross registered tons — twice that of many of the vessels that for years represented the industry standard. On-dock provisioning requires more than a few forklifts. The vast amounts of goods required by these vessels make it necessary that docks be designed so that 20- and 40-ft. containers full of provisions can be loaded aboard, often in places where service doors on older generation ships had not been located. Of course, the terminal itself must be able to deal with the sheer volumes associated with the pleasure ships that carry 3,000 or 3,500 or more passengers. This means sufficient queuing and waiting areas so that these thousands of people may be swiftly and efficiently processed and embarked. The same flows must be handled at disembarkation, so, in both processes, there must be sufficient passenger access; hence, current designs may call for dual gangways, each of a width of eight or more feet. After disembarkation, there must be a laydown area to handle and process through Customs upward of 7,500 to 8,500 pieces of luggage. To serve these, cruise ports must furnish a seamless transportation system for both passengers and baggage between the airport and the ship and vice versa. To accommodate passengers who drive to the port, extra-large parking garages have become requisite for seaports that host — or are hoping to attract — the largest of industry vessels. As a bonus, parking revenue is usually the second largest profit center for cruise ports. While these and other sweeping adjustments are necessary at places visible to the more casual observer, other changes are being made below the water line. Just because these modifications are not readily visible, they are nonetheless equally essential to support these massive ships. An excellent example of this relates to the impact of Azipod propulsion systems upon the structural integrity of retaining walls and piles. The Azipod systems that are increasingly finding their way onto the latest cruise ships replace the traditional wheel Circle 212 on Reader Service Card The Royal Viking Sun Photo Courtesy of Wartsila Marine. Gaylord^ is a registered trademark of Gaylord International, Inc.
GAYLORD INDUSTRIES, INC 32 P.O. BOX 1149 TUALATIN, OREGON 97062-1149 USA FAX: 503-692-6048 PHONE: 503-691 -2010 email:edsong@gaylordusa.com Circle 232 on Reader Service Card and rudder. Azipods are rotating pods that contain powerful motors capable of rotating 360 degrees. This in turn allows for remarkable maneuverability without the need for rear thrusters. Cruise lines are using more Azipods because of their benefits — from fuel savings to freeing up hull space in order to add income-producing berths. Ports need to prepare for the impacts of azipods. The high water velocity generated by conventional thrusters during a berthing operation already can threaten support structures such as piles and sheet piles in some ports. The scouring and undermining from this high water velocity can eventually cause a failure of a pile or wall. If one considers that Azipods can be nearly 10 times as powerful as conventional thrusters, it is easy to see that there indeed is a need for planning. An Azipod utilizes about 14 mkW, while a conventional thruster uses about 1.5 mkW. Also, the center of water forces exerted by Azipods is lower and therefore closer to the bottom and to key berth supports. The level of impact upon ports will depend upon such factors as the type of material that supports water from structures. For example, waterfronts where rock prevails should be less vulnerable than those with sand and clay. But all seaports would be welladvised to consider the potential for Azipod-related scouring impact and seek solutions. Gee & Jenson has worked with many seaports in managing such potential impacts by: surveying berth conditions to evaluate the potential for scour damage; installing deflectors in the Azipod velocity zone; using scour mats to protect vulnerable area; protecting the base of areas of vulnerable piles and sheet piles; and designing new berths that are resistant to scour damage. As is the case with so many issues, some of the simplest (and best) solutions can come by way of open, frank discussions. In this case, communications with ship operators can help develop berthing plans that designate Azipod zones to minimize potential for scouring impacts. With such massive cruise ships not only providing vast profit potentials for cruise ports and their environs but also posing potentially big challenges for seaports, it has never been more important for seaport operators and those who utilize their facilities to work closely together and with qualified terminal facility experts to ensure maximum levels of service for vacationers while minimizing the possibility of negative impacts.